Preheat the oven to 200C,400F, Gas Mark 6. 3 minutes before the fish is cooked, slice the brioche bun in half and place cut side up on a baking tray in the oven to crisp slightly, this should take about 3 minutes. Remove the fish and the brioche bun from the oven. Sprinkle the baked fish with some freshly ground red peppercorns. To serve; Place the flatter half of the bun on a plate and top with some salad leaves. 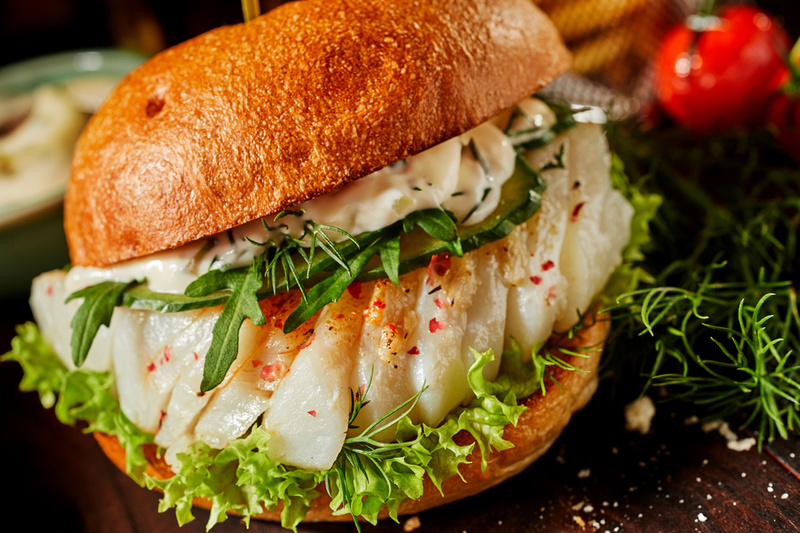 Place the cooked fish on top and then layer on top the sliced cucumber (or sliced gherkins if you prefer) and a few more salad leaves, top with the caper sauce and place the other half of the brioche bun on top. eat straight away.